leaves no greasy film-non-smear. Quick and easy to use. Removes static from VDU's. Ozone friendly. Does not contain chlorofluorocarbons. 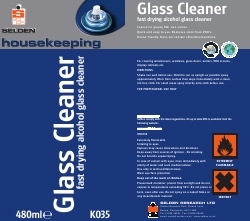 For cleaning windscreens, windows, glass doors, mirrors, VDU screens, display cabinets etc. Shake can well before use. Hold the can as upright as possible spray approximately 20cm from surface then wipe immediately with a clean, lint-free cloth. For small areas spray directly onto cloth before use. Composition A blend of solvents, surfactant in an aqueous base.